Since I first posted about Reading Appendix N, I’ve been pointed to several similar reading lists that are either contemporary with Appendix N or related to it in some other way. None of them are additions to Appendix N — to date, Gary’s 2007 additions are the only ones I’ve found — but they’re all interesting for their own reasons. The first two were written by Gary, one predating Appendix N and one written much later; the second two were written by Tom Moldvay and Steve Winter, respectively. Let’s start with Gary’s two lists. 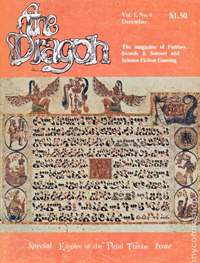 Published in 1976, this issue of Dragon came out three years before Appendix N, and it’s essentially a proto-Appendix N. Squished into one corner of a page showing recent fantasy miniature releases, it lists 22 authors and roughly 30 specific titles, all of which appear in Appendix N — with one exception: Algernon Blackwood. I’m not at all familiar with his work, but he was apparently a writer of supernatural tales; he’s on my mental list to check out (in 2014 or so, when I finish reading Appendix N…). In all other respects, this list is a subset of Appendix N. There’s no similar list in the original edition of D&D, nor in the Holmes edition, so I believe this list in Dragon #4 may be the first D&D reading list. 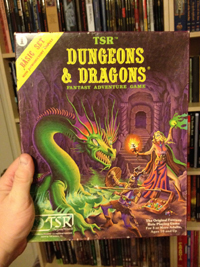 As the foundation of Appendix N, it’s a neat little piece of D&D history. About half of the authors are new (not included in Appendix N), and many of them are folks I don’t associate with sword and sorcery, sword and planet, weird tales, or the other kinds of books represented in Appendix N — Margaret Weis and Anne McCaffrey, for example. Gary also lists himself, which makes me smile. The 1981 D&D Basic Set (the “B” in the edition often called B/X) came out in 1981, just two years after Appendix N, and it includes one hell of a reading list. While this one is by Tom Moldvay, not Gary, it is in a D&D core book and it’s roughly contemporary with Appendix N.
What I like most about Moldvay’s list is that it’s broken down into categories: young adult fantasy, young adult non-fiction, adult fantasy, short story collections, and non-fiction. Given that B/X D&D makes a great gateway product for young adults and teens, devoting about 40% of this list to books aimed at them is an excellent idea. 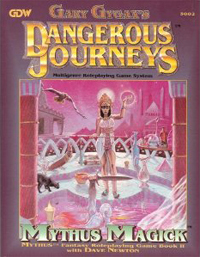 Of the four reading lists in this post, Moldvay’s is my favorite — and it’s huge, with roughly twice as many authors as Appendix N.
Star Frontiers came out in 1982, three years after Appendix N was published. It focuses on science fiction, of course, and it’s a neat list in its own right. 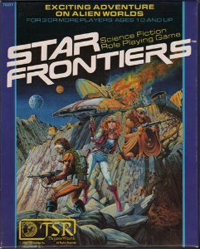 It includes non-fiction as well as fiction, which I like, but I mention it here largely because there’s some overlap with Appendix N in terms of authors: Poul Anderson, Fredric Brown, L. Sprague de Camp, Philip José Farmer, Andre Norton, Fred Saberhagen, Jack Vance, and Roger Zelazny all appear on the Star Frontiers reading list. Lots of other gaming books include reading lists — GURPS books, for example, are justly famous for their killer bibliographies — but these four lists stood out to me because they have some connection, be it strong or weak, to Appendix N. They all look like they’re worth exploring, assuming the 100-book Appendix N reading list isn’t keeping you busy enough!